In its endeavor to offer the best cinematic experience to its customers, Sony India launched its first Dolby Vision™ capable UBP-X700 Ultra HD Blu-ray™ Player. This latest edition in Sony’s wide range of 4K Ultra HD Blu-ray players produces myriad colors, greater dynamism and sense of realism as compared to standard HD players. The UBP-X700 complements the HDR viewing experience as it supports HDR10 and Dolby Vision™ via a Firmware update. The player offers 4K Ultra HD Blu-ray playbacks that shows everything in finer detail for a more real-life picture. Optimizing the way the HDR picture is delivered from the player to the TV screen, the UBP-X700 supports HDR10 and Dolby Vision for ground-breaking detail, color and brightness. The same will be available soon via Firmware update. An HDR10 signal contains up to 100x the brightness of a standard (SDR) signal, massively increasing peak brightness while retaining deep and highly-detailed blacks upscaling the visual experience for ultimate immersion. The 4K processing ensures a cinematic experience by bringing over 8 million pixels to life and a picture quality that is four times richer than Full HD. The UBP-X700 player incorporates four times the resolution of conventional Blu-ray™ (Full HD), with new 4K Ultra HD Blu-ray™ discs and 4K streaming services including Netflix, Amazon Prime Video and YouTube. The player further supports a broad range of video and music formats, including MP4, DSD, FLAC, and othersthat ensures a complete cinematic experience for the viewers on the go. To help with easy streaming, the player comes with an intuitive menu, interface, apps and features which are organized in a simple manner, so that one can always find what they’re looking for. 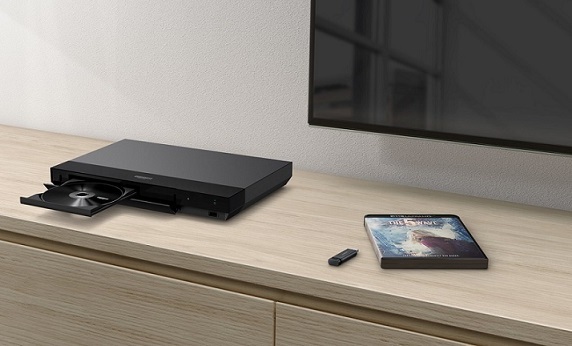 The UBP-X700 also brings access to a world of 4K streaming services. The newly launched player features advanced upscaling of all the movies to 4K resolution, with this your favourite movies will upscale to 4K clarity, so you can enjoy extreme details even in a Full HD video. 60P i.e. 60 fps recording makes sure you get super smooth details, rich videos with enhanced clarity even in high motion videos. Consumers who have 4K-SDR TV can also view 4K HDR content with high picture quality using Sony’s unique technology. With this feature every object is sharpened and enhanced in real time, so that one can enjoy detailed images which is perfect for the latest high resolution TVs. HDR-SDR conversion technology intelligently scales HDR’s ultra-wide brightness range into an SDR image, maintaining outstanding picture quality even with conventional SDR TVs. Watching 4K HDR films on non-HDR TVs is now a delight as it incorporates additional shadow and also highlights each and every detail on the screen. Dolby Atmos is an HDR solution that creates an enveloping and engaging cinematic atmosphere at home. It helps to bring scenes to life with striking highlights, deeper darks, and vibrant colors. This features delivers breath-taking realism with sounds that moves around in three-dimensional space. A new sensation of height immerses one in the action, creating a full audio atmosphere and realistically depicting objects moving overhead. DTS-X can create an unlimited number of audio objects which adapt to your speakers in real time, to get the biggest impact out of every move soundtrack. With DTS-X support in UBP-X700, you can get the best sound output from your speakers. For enriched and unparalleled visuals, the player supports the new BT.2020 colour, which provides access to wider range of colors than what conventional TV signals offer. This ultra-wide color space means content creators can deliver much more saturated and realistic color from deep aquatic blues to natural greens and vibrant reds. To get the best cinematic experience at your home, you can pair your UBP-X700 with Sony’s HT-ST5000, 7.1.2 Wireless Home Theatre system. ST5000 complements X700 by supporting features like 4K signal pass through, DTS-X and Dolby Atmos Sound support and makes your overall movie experience memorable. The product will be available in select Sony Centers across India.